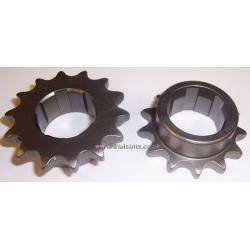 A Talon or similar gearbox sprocket for the BSA C15 and B40 trials models. These are suitable for use with a 428 chain. Available with 13 teeth. (14 teeth has been discontinued) Please note these sprockets are much smaller than standard, and your chain may foul the standard sprocket lock nut. If this is the case, you will need to make alteration to the locknut until it clears the final drive chain.